I had a great day out yesterday. 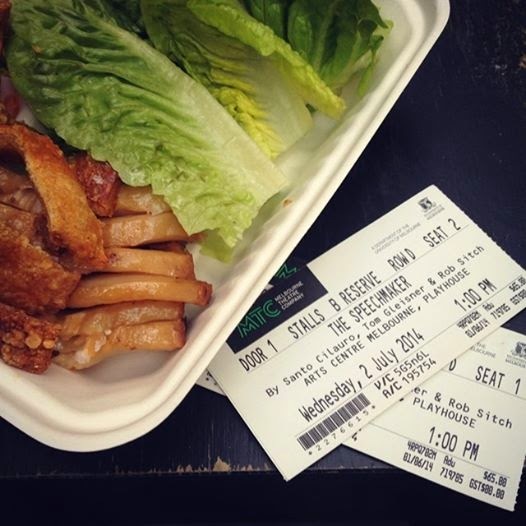 We went to see 'The Speechmaker' at the Arts Centre, written by the Working Dog team and performed by a well-known cast. I really like Jane Harber who stars in both 'Offspring' and 'The Moody Christmas' series. It also stars Kat Stewart, Erik Thomson and Lachy Hulme, who despite having a smaller part was quite impressive. While the others 'played' a character, he just is the character. The season sold out really quickly so I was glad we got tickets. It was slick and witty and made some interesting satirical observations about political motivation, particularly in the U.S. It warmed up, with the second and third act better than the first. We then finished with a quick bite at the pop up 'Rue on Collins'. I ate the pork belly Bo Ssam from Kong. It was okay, but I wouldn't get it again. I was swayed by on line recommendations to try it but considering I don't love pork crackling I should have got the ssam-style roti wrapped with pulled pork and wombok cabbage kimchi and mayo - I hate, hate, hate food envy!! The hubbby had a Mr Papadopolous souvlaki from Jimmy Grants which is a mix of lamb, mustard aioli, chips and onion; he was impressed and said it was really good. They also had a grain salad that sounded great and I just found the recipe, I will be making it soon! This breakfast was inspired by another great recipe from Teresa Cutter, her Winter Warming Porridge with Chia Aromatics . It makes an excellent change up from oats and I really enjoyed it and I'll be making it again. 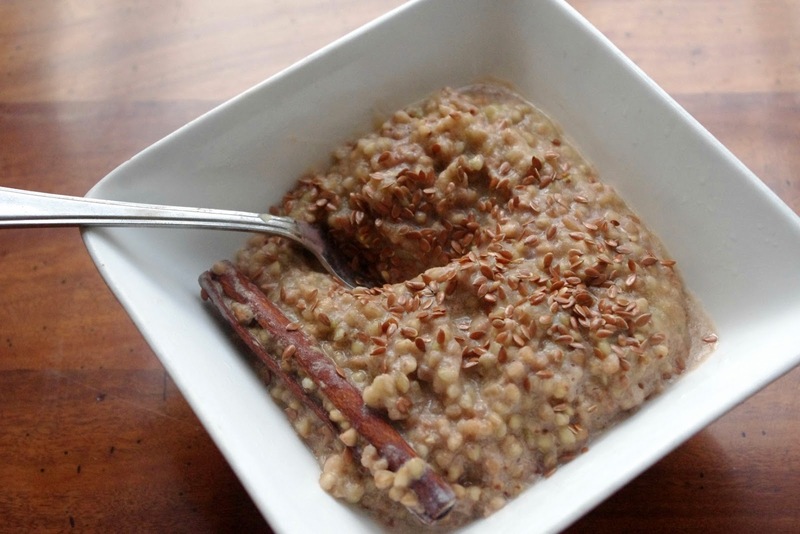 Buckwheat is gluten free and low GI which makes for a great breakfast option. Dry-roast 1/2 cup of buckwheat grouts in a saucepan for a couple of minutes until it starts to smell nutty. Add cinnamon stick, 1 1/2 cups of water, 1 teaspoon of vanilla extract and cook for 10-15 minutes over a low heat. When it is cooked through, add 1/2 cup of milk of your choice and stir through 2 large tablespoons of apple sauce. Sprinkle with some flax seeds and serve. I made this salad for a family lunch get together and set some aside for my lunch the next day. It is adapted from Pinch of Yum's Fresh Quinoa Salad with Honey Vinaigrette. It was popular at the lunch - here's the recipe for you Auntie Noel! Dice and cook three rashes of bacon. When the bacon is cooked blitz it in a bowl with the stick blender to make it into a crumb. Use the stick blender to also crumb 1/2 cup of almonds. Pour boiling water over 1 cup of frozen peas to cook quickly and keep the bright green colour. I used fresh basil, parsley and a little mint to make up 1/2 cup of herbs. I'd probably leave the mint out next time I make this salad. The vinaigrette is made from the juice of two lemons, 1/3 cup oil from the feta cheese (or you an use olive oil), a pinch of salt and 2 tablespoons of honey mixed together in a jar. Mix it all in a bowl and crumble over 1/2 cup of feta cheese to serve. 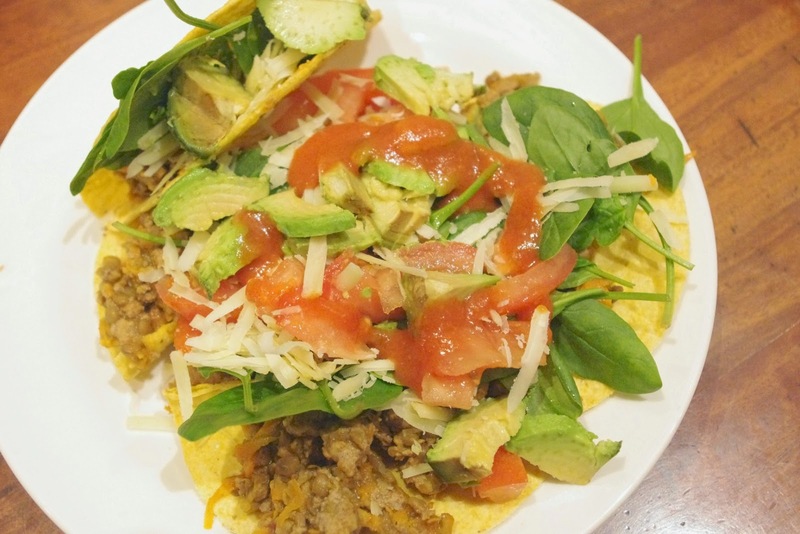 I like to break the shells up and layer with the mince, avocado, tomato, spinach leaves and a sprinkle of cheese. The mince is ramped up with the addition of carrot and lentils and I had some spicy sauce left over from a chicken enchilada casserole earlier in the week. MJ ate almost as much as me over his chanting of "We love Daddy's tacos, we love Daddy's tacos!" In the mix: One banana, sugar-free banana drink flavouring, Greek yoghurt, milk, ice and flax seeds. Tastes so good, yet all good for you. It's really a meal in itself and is a filling and delicious treat. It's becoming a bit of a regular. Oh yumm! All of these look delicious! I am particularly intrigued by that buckwheat porridge. If I wasn't sticking with paleo right now, I would make some immediately ;) However, I think I will try that soon for my toddler. I also think I'll try that bacon feta pea salad with cauliflower rice. Not sure that I'd be able to replace the feta with anything. I guess a little cheating won't hurt! Cashew cream sounds awesome! You're brilliant ;) The overnight porridge also sounds like the perfect fit for me given my dislike of cooking breakfast. I could also still manage to feed my kid something healthy with minimal effort! Woohoo! Lol, happy days! If you make the salad I'd love to hear how it goes! !